A couple of months ago, I received an Itead Studio Sonoff and Slampher module that are meant for some home automation by using their app (and platform). I’ve made some short videos about the modules and a dissasembly. Because both modules run on the ESP8266 chips, reprogramming them with custom firmware seemed obvious. Itead even made it that easy that they provided a 4 pin header (there are now modules with 5 pin headers, but I believe I received some old versions. Mine include the 433 RF functionality). After much experimenting, I could not get the boards (both Salmpher and Sonoff) in flash mode (program mode). This was highly frustrating as all the other people seemed to be able to! So WHY was it not working? Checking many websites, the instruction was always the same: Hold the button, plug in the USB interface, set the programmer tool to 1MB of flash and program the board. Frustrating, it didn’t work. The boards did not go into program mode! After much more searching, I encountered a comment on Peter Scargill’s blog post from Alberto Avina. After trying out this little trick on my Slampher module, it worked!!! Finally I could follow the standard instructions and flash new firmware. He only mentioned the Slampher fix, but my Sonoff was behaving the same. Therefore, the search began on the Sonoff board which resistor they forgot (or on purpose) did not install. 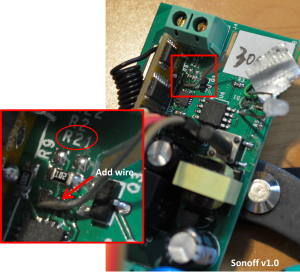 The search was finalized quickly by using the Sonoff schematic (R21 towards the E-FW or GPIO0). After putting a little wire on both footprints, both the boards now work! For your reference, I have attached pictures of which resistors to fill in. SO you just solder the wire to flash the firmware, and take it off after ? The little wire stays. It doesn’t impact normal operation. It appears I have a slightly different board from yours. 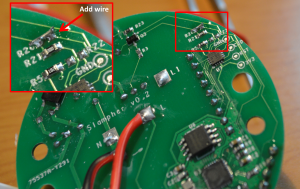 Do you think you could circle where I have to solder the wire on my board attached if it can be done? Hi Steven, It looks like you have a version withouth the RF module. Therefore they removed some stuff from the board! The rest of the PCB looks quite the same. I believe you don’t have anything to do. There is a 0 ohm resistor on the place I soldered a wire, so you should be ready to go. I connect my Sonoff wifi only to a FTDI232. when booting in firmware mode or after should the green led of the device be on? It seems I cannot boot in firmware mode. I have the 0ohm on R21 version. but holding down the button while plugging into usb does not seem to work. Any advice? Hi Cristi, great to hear! Do you have a write-up of your work? I’m always interested to read! I’m having a hard time getting this to work. I’m fairly certain I’m using a sonoff RF, it has the extra component with the antenna and I have tried booting it with rx-tx/tx-rx and rx-rx/rx-rx. How can you tell if the sonoff is booted in programming mode? When it boots normally, the relae flips once and the light starts blinking slowly and the a green amber. When I boot it while only hodling down the button, the green light blinks quickly and the sonoff creates a new wifi network. I believe your device is still in the modes foreseen by Itead. My memory is getting a bit hazy on the details, so I’d recommend hopping over to http://captain-slow.dk/2016/05/22/replacing-the-itead-sonoff-firmware/ which is still very active! Thanks for keeping this article up to date! My devices are currently lying in the closet, due to different priorities. So can you just solder bridge the gap? Hi, Thank you for this information! I managed to flash my Slampher (v 0.2) with the Sonoff-Tasmota firmware. I have about 8 Sonoff devices all flashed with this firmware and i am using it with mqtt and openHAB. All are working perfectly. But with the Slampher i do not know how i can get the device in WiFi Access Point Mode in order to configure the firmware with the correct wifi and mqtt settings. With the other Sonofs i have (WCD and Basic) you have to press the button 4 times, then the firmware enters in Wifi access mode. But with the Slampher this does not seem to work. So, I understand you correctly that also on the slampher you have the Sonoff-Tasmota, where you could normally get your device in the right mode? It’s been I while that I played with these, but it could be worth checking out the pinout, but also make sure you don’t need the little hack described here. I remember it had to do with the pull up/down of the switch. You just saved my Sonoff RF throwing into bin. Great finding and so easy to do. Brilliant. Well, that’s awesome to hear on a friday evening 🙂 What are you creating? Well, all I am doing at the moment is more testing, rather implementing home automation stuff. I have one Sonoff RF, which (thanks to you) I managed to flash finally with Tasmota. I also have one Sonoff Basic, which I flashed with it few days ago. I also have two no-name WiFi plugs with Esp8266 modules which are operated by Smart Life app and I am still wondering if there is any way I can also flash them with Tasmota, so my Hass.io Home Assistant can pick them up. Rpi3 just got HA installed few days ago, which I still need to configure for Samba share, MQTT broker, etc. All this supposed to be basic setup, so when I say “night night” or something like that, it will switch all downstairs lights off and switch bedroom light on, etc. I know it’s complete basic setup, but eventually it’s going to be bigger and bigger. Actually echo dot doing this at the moment, but HA, MQTT there is so much potential in there. Now I would like to get some more sonoff’s. Ufff, that took a lot of writing. I think I celebrated success to early. Although your method still works, my Sonoff RF is dead (I think). Long story short… I had problems with it since the very beginning. It worked when I first plugged it in. When I unplugged it and plugged in again after few minutes it did not turn on. Every gap between unplugging and plugging back in had to be minimum 24hrs, otherwise it would not work. Never had that problem with sonoff basic. I could plug it in and out as often as I wanted to. When I flashed it with tasmota yesterday, first thing I tried was plugging it in few times and it worked, so I thought it was software issue before. Happy with results I installed it to main light. After about 20 minutes later, I could not turn light on using RF remote. Also it would not respond to main button on the switch itself. I thought I could flash it again today, so I did, with success. But after plugging it in, no response again. LED is not blinking at all (it does flash when installing tasmota). Correct me if I am wrong, but it did not behave normal from very beginning? I’ve experienced similar funny things. The issue is that the ESP is coming from China. That’s not necessarily bad, but there are many modules out there, and not all might be of good quality. Also, hardware (soldering) might be acting up and your USB-TTL converter might be causing issues. I’ve also seen issues with the power supply. Did you try getting serial output to see if the device is properly booting? Hi, thanks for your reply. Unfortunately I don’t know what procedure you are asking me about. Thanks. When your USB-Serial adapter is connected, you can use it to flash the device, but if you connect a terminal program to the COM port, you should also see Serial output from the ESP8266 (I’m not sure at which baud rate, it depends on your firmware). It could give you hints why it’s booting or not. I think I will leave for now. Like I mentioned, I had problems with it since the very beginning, so there is possibility that something went wrong during production. Maybe I will come back to it one day. I did the same thing with mine… Fun things, but sometimes not very reliable; also I hate programming & debugging them. Keep me posted on other endeavors. Always nice to see. Got a website/twitter? No website, but you can find me on Twitter and Instagram under cholek3. Hi! After flashing Tasmota into the sonoff rf, does the remote still work? I’m afraid that I don’t know. I checked their github page, but didn’t see a mention of RF. Maybe it’s one of the chips that are in their supported list. Yes, it does. If I remember correctly, you have to use same pairing method as you do with standard sonoff firmware. Actually, it’s all explained here. This is how I found your great article. Oh didn’t know that page existed! Thanks for sharing! I think you will need a wire to pull R21-2 to GND during boot because it will need to be removed to pair the RF control. It’s been a while since I looked at this, so I can’t tell you!